Cannabis has been a part of human life for over 10,000 years. Here’s why we have cannabinoid receptors and what they mean for overall health. Have you ever wondered why cannabis has such strong medicinal and psychoactive effects? The herb interacts with the body in ways that no other plant can. The plant contains chemical compounds that are unique to cannabis alone, making it an anomaly in the great wide world of flora. These compounds are called cannabinoids and they are able to engage with special landing locations on human cells. But, why do we have these cannabinoid receptors, anyway? Here’s the answer. Cannabis compounds engage with these receptors, but that doesn’t mean they were designed specifically for cannabis. Instead, we have cannabinoid receptors because the human body creates its own version of cannabis compounds called endocannabinoids. Endocannabinoids are like the body’s own tetrahydrocannabinol (THC). THC is the primary psychoactive in the cannabis plant. Endocannabinoids are often left out of medical textbooks, yet they are of infinite importance for human health. Endocannabinoids tap into what has been termed the endocannabinoid system (ECS). The ECS is one of the largest neurotransmitter networks in the human body. Neurotransmitters are communication molecules that help the brain and the body communicate with each other via nerve cells. The ECS is a neurotransmitter network that acts as a homeostatic regulator. This is a fancy term for a system that helps maintain optimal balance in the body. The ECS helps coordinate messages between the brain and the body, ensuring that both respond appropriately to both internal and environmental stimuli. For example, research suggests that the ECS helps maintain the sleep-wake cycle, ensuring that your body becomes tired at the right time and helps you wake up in the morning. Similarly, with appetite, endocannabinoid molecules tell when you’re hungry and signal that it’s time to eat during certain parts of the day. What makes cannabis so beneficial? It just so happens that the active compounds in cannabis, cannabinoids like psychoactive THC, directly engage with the ECS. The plant can produce at least 113 different cannabinoids, though not all samples will contain all of these different varieties. This class of compounds has not been found in any other plant. Though, some herbs do contain compounds that act similarly to cannabinoids and also engage the ECS. However, none of these compounds function exactly like those found in cannabis. All foods contain molecules that can have drastic effects on the human body. The cannabinoids found in the cannabis plant are like the plant versions of our own endocannabinoids. While these plant versions are surprisingly powerful, they do not fit into cannabinoid receptors or function quite like our natural molecules do. However, plant cannabinoids can be an important supplement for the ECS. Other foods, like flax, also contain plant compounds that take the place of natural molecules in the body. Flax contains what are called phytoestrogens. These are plant-based estrogens that can engage with estrogen receptors in the human body, modulating their effects. The phytocannabinoids in cannabis are similar, only they operate on cannabinoid receptors. Humans may not have been “meant” to consume cannabis, but the herb has certainly been a key part of the development of agricultural, medical, and spiritual history. Some theorists even go as far as to suggest that cannabis cultivation may have played a major role in the transition from hunter-gatherer societies to farming communities. From the evidence thus far, cannabis is thought to have originated in the fertile crescent. This the same region that marked the beginnings of modern agriculture. From there, the plant has since spread to every continent and has been used for thousands of years by cultures all over the world. Today, it remains the world’s most popular illicit substance. 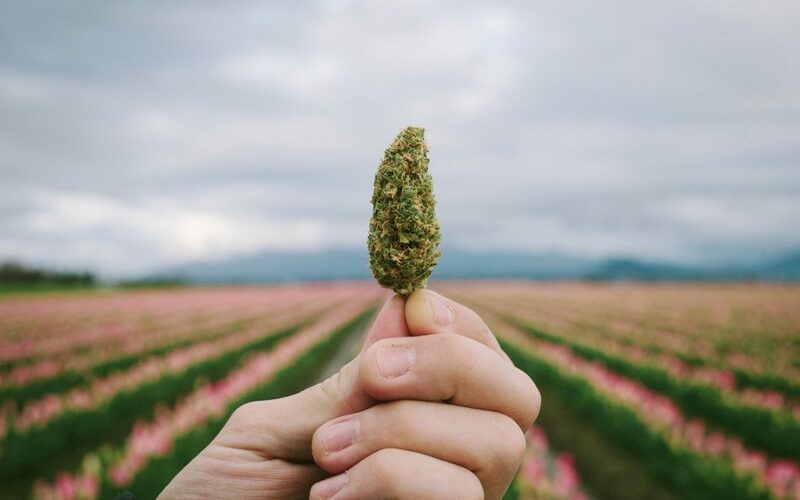 Unlike many other plants commonly associated with the birth of modern agriculture, like wheat, cannabis is a multifunctional plant with many beneficial uses. Stalks can be dried and harvested for fiber, which can be used as building materials and as fabric textiles. Cannabis seeds are thought to have been an extremely valuable source of nutrition for early humans, providing an excellent source of essential fatty acids as well as protein. On the medical side of things, there is a wealth of archeological and historical data that suggests that the plant has been used in a wide variety of ways by cultures throughout the world. The plant was a popular choice for women’s health issues like menstrual distress and labor pains. It was also used by multiple societies as a pain relief tool and was frequently applied topically to wounds and injuries. Thanks to the plant’s psychedelic properties, the herb was also used as a means to facilitate spiritual healing. It’s estimated that cannabis is one of the oldest domestic plants. Researchers suggest that it has been used by humans for at least 10,000 years, if not longer. That’s a lot of time to coexist and utilize one particular crop. While cannabinoid receptors might not mean that humans are “designed” to consume cannabis, there is no doubt that the several-millennia-long relationship we have had with the plant shows that it is an important part of human health. Unfortunately, thanks to misinformed political policies over the last century, Western cultures have lost touch with a relationship that took over 10,000 years to develop. During the past 80 to 90 years, cannabis consumption has still been a regular part of everyday life for many individuals. However, our relationship with this plant became taboo to discuss and was pushed underground like a dirty secret. Thankfully, the word has finally gotten out about the amazing benefits of cannabis. It’s time to rekindle this long-lost relationship.